We are interested in plant responses to ever-changing environment. Our aim is to elucidate the signaling pathways in response to environmental signals, such as blue light-induced stomatal opening, abscisic acid-induced stomatal closure, light- and phytohormone-dependent plant growth/development, and regulation of the plasma membrane H+-ATPase. 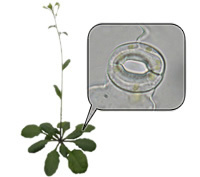 Copyright (c) Laboratory of Plant Physiology Kinoshita Group All rights reserved.